People of all ages, shapes, sizes, and abilities can benefit from regular physical activity. 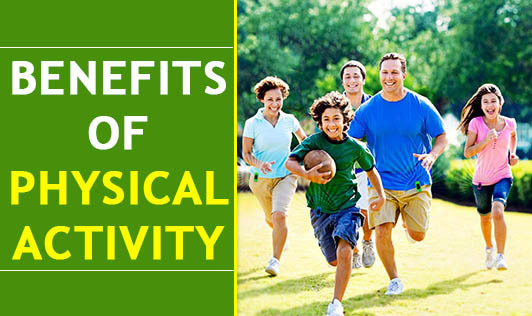 Following are some of the benefits of indulging in regular physical activity. Cuts your risk of high blood pressure. Reduces your risk of diabetes. Improves mood and decreases risk of depression and anxiety. Builds stronger bones which prevents fractures. Helps you live a longer, fuller, happier life. Choose activities you like to do. Walk, bike, swim, exercise with a video, walk the dog, and play active games with the kids. Choose activities that are appropriate for your present fitness level and health condition. Start small. If all you have is 10- or 15- minutes of time a couple of days per week begin with that. Be active during work breaks. Some activity is better than none. Build up gradually over time. Lengthen your activity period from 10-15 minutes to 20-30 minutes. Gradually increase to 3 days, then 4, and finally to a minimum of 5 days each week. Pick up the pace. As you get fitter, you'll be able to walk more briskly. Aim for at least 30 minutes of moderate activity, most days of the week. Add strengthening and stretching exercises at least twice a week. Choose activities that work all the different parts of the body - legs, hips, back, chest, stomach, shoulders, and arms. Keep a record. Write down your exercise goal and keep track of your progress. Avoid injuries. Get comfortable training shoes and use the right sports clothing to keep warm or cool as needed while active. Drink plenty of water, especially in warm conditions. See a healthcare provider if you have a health problem.